I love their color, I love their shape, I love that they store so well and last forever, I love their taste, and I even love their greens. 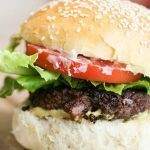 I make amazing vegetarian patties with beet greens. Here in NC, we can grow beets twice a year; in the spring and in the fall. I sprinkle the seeds around and as they grow I thin the plants and use the young greens I pulled for the patties or in salads. 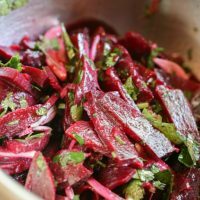 When the beets are ready for harvest we usually use the roots for beet salads (there are many kinds of salads other than the one I’ll share with you here), and the greens and stems are used in veggie patties or as cooked greens. Beets are very low in calories, they contain no cholesterol, and are very rich in vitamin C, iron, copper, phosphorus, magnesium, and fiber. They are so healthy, however, they do contain the highest sugar content of all vegetables, which is probably the reason they are so darn tasty! 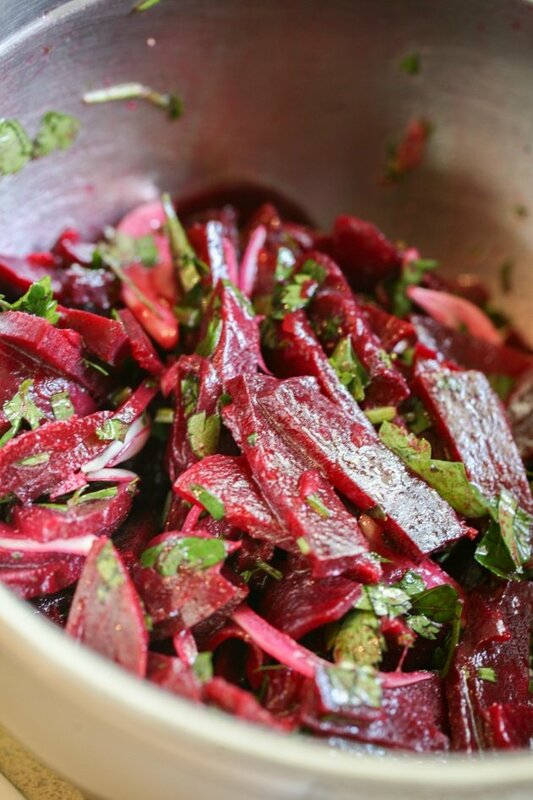 We started with a small colander full of beets. Some were small, some were big but there was probably the equivalent to three or four very large beets from the supermarket. Note, when I say we I mean my parents. They were here for a visit from Israel and were making us beet salad, I was just taking pictures which I believe is how every meal should be done! Anyway, the first order here is to soften the beets. You can either steam them or throw them in a pot of water, bring to a boil, lower the heat to keep a rolling boil, and let them hang out in the pot until they are soft which will take awhile (maybe 40 minutes or so…). We don’t peel the beets but we do remove the greens obviously and wash them really well. If there are really big ones we cut them in half or quarter them to speed up the process. 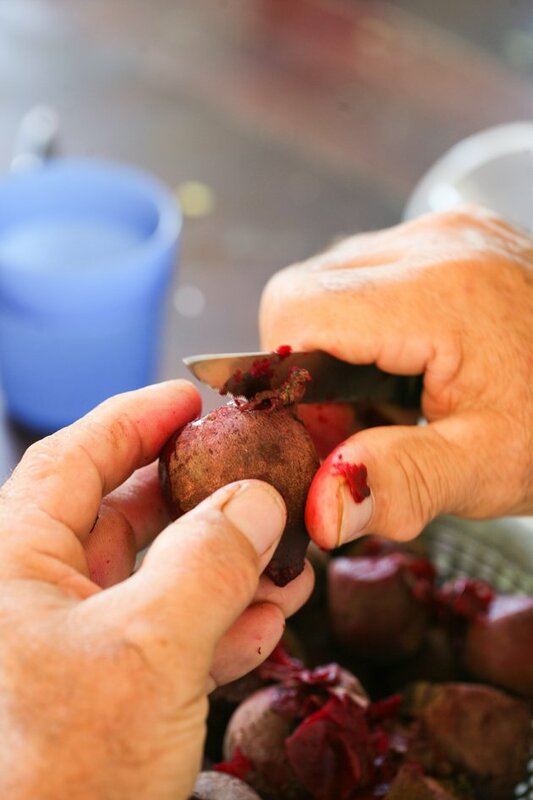 To check if the beets are soft you can simply stick a fork in them like you would do with a potato. I like mine still a bit firm. Once they are done, scoop them out of the pot and wash in cold water to cool them down. Next you need to clean and peel the beets. Once they are soft, they peel very easily. My dad likes to do this with a knife like you see in the picture above. I usually use a potato peeler. 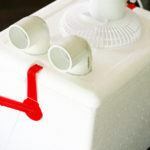 Once they are clean and cool you are ready for the next step. 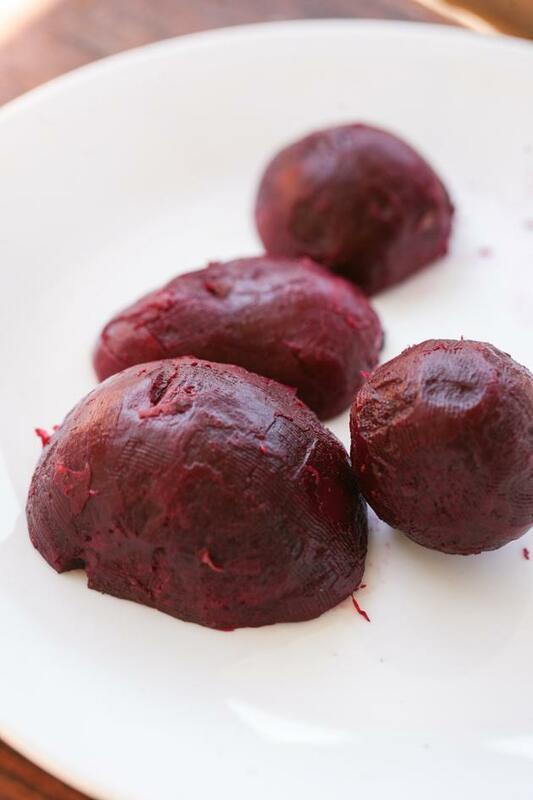 Note that you can use the water you boiled the beets in as a natural dye if you want. 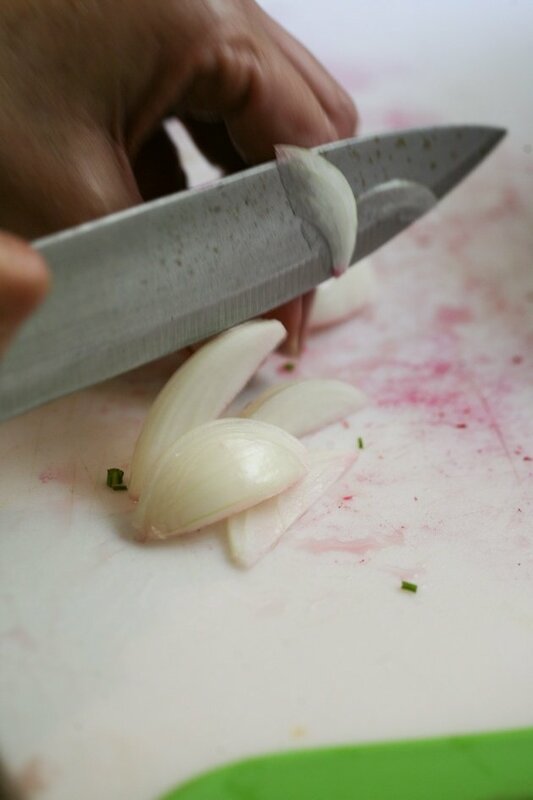 Next, chop a very small onion (just a bit bigger than a shallot or half of a medium-small onion). You can dice it or slice it into thin slices. Up to you. To season, add one tablespoon of canola oil, two tablespoons of vinegar, half a teaspoon of cumin, and salt and black pepper to taste. 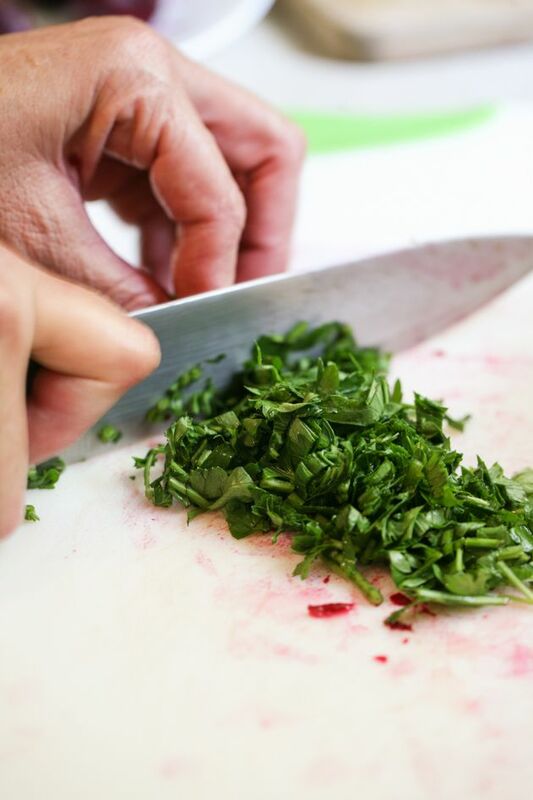 Give it all a big mix, taste, and fix the seasoning if you feel that you need to add salt or something like that. Sometimes my mother adds a clove of minced garlic as well but that is optional. Of course you can serve it right away but this is one of those salads that is even better the next day. It’s a really good salad for entertaining because you can make it ahead and store it in the fridge until the party. 1. Clean the beets from the greens and wash well. Chop large beets into chunks. Add the beets to a pot of water and bring to a boil. Lower the heat to keep a rolling boil until the beets soften (might take around 45 minutes). 2. 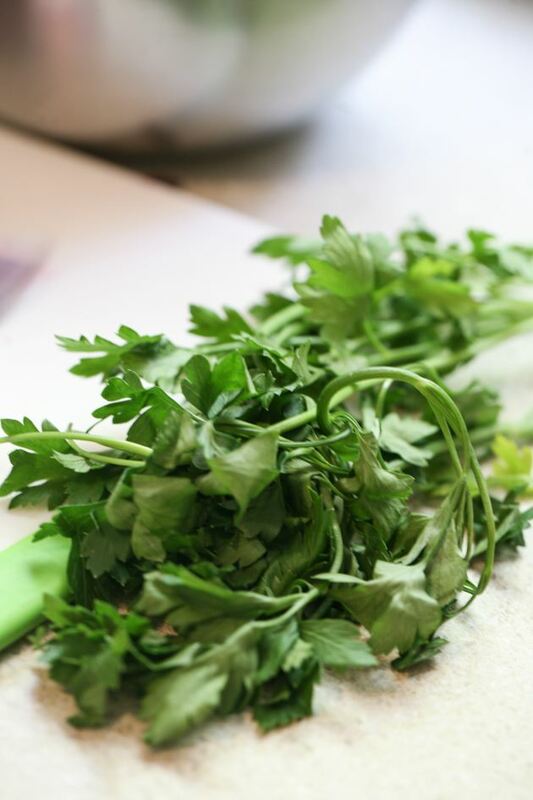 While the beets cook, clean a bunch of cilantro from stems and chop the leaves. 3. Dice or slice a small onion. 4. 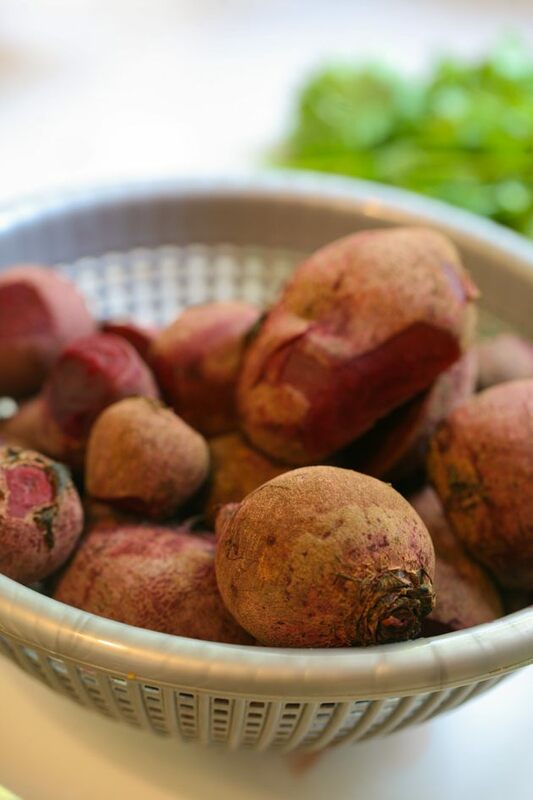 When the beets are soft remove from the pot and wash in cold water to cool them. Peel and slice or dice. 5. 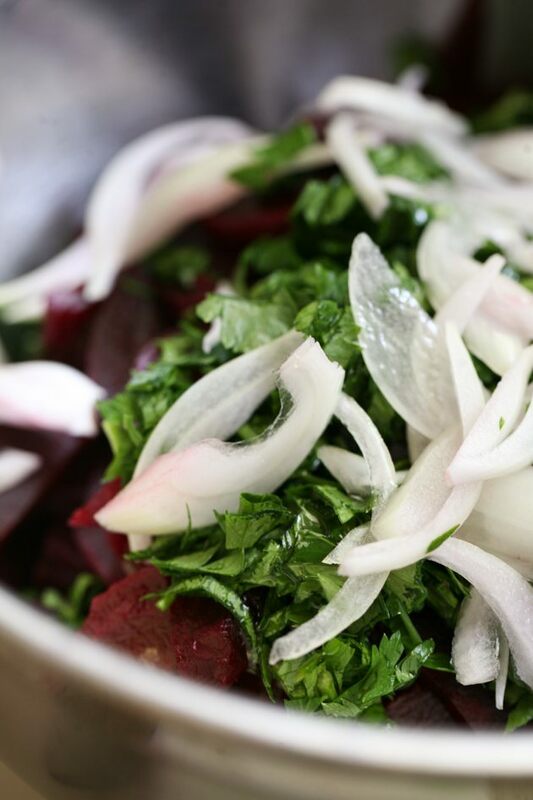 Add beets, onion, and cilantro to a bowl and season with oil, vinegar, cumin, salt, and pepper. 6. Serve right away or store in the fridge for a few days. We’ve communicated previously but not for a long time. I live in a dry climate (Colorado) and, just to make gardening more challenging, live at 7300 ft. elevation. We finished our carport-frame greenhouse early in the summer but not soon enough for the seedlings we started inside in April, so we planted them in a straw-bale garden. The straw bales worked great because our soil is rocky so we didn’t need to dig that up! We placed soaker hoses on the bales, watering every couple days using a timer. To keep the elk, deer, bear, and rabbits out of the veggies, we put up 7 foot vinyl fencing and installed a “Scare Crow” motion-activated water shooter; the elk ran from it! Quite entertaining! Our beets, yellow squash, kale, leaf lettuce and dill did well. We have a large brown bag of green tomatoes (snow today). Broccoli, peas, swiss chard, and carrots are still out there. I called this year’s garden “an experiment” since we haven’t planted one in many years. Hopefully it will pay for itself next year. 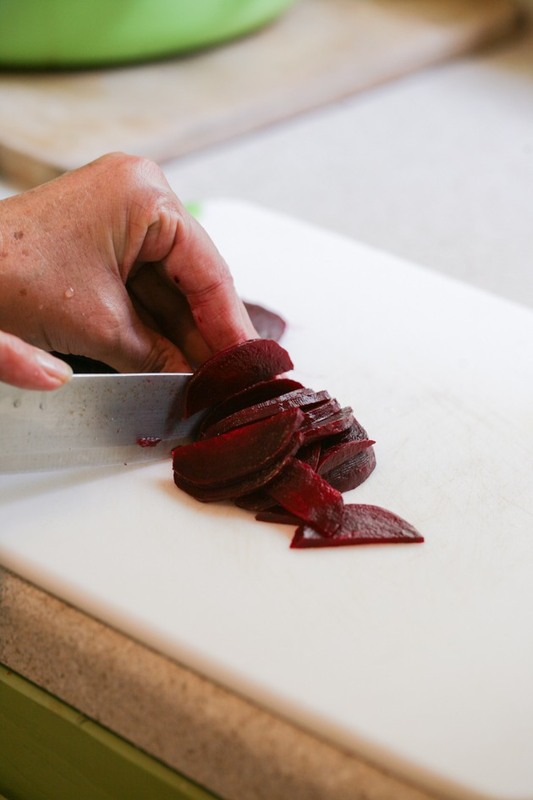 We cooked some of the beets (with 2″ of stem and the root still attached) and, after cooling them, put on latex disposable gloves, rubbed off the peel, stems, and roots; the beets looked beautiful! I suggest you try this method! We still have our 1952 dump truck which we’ve used for hauling and landscaping. Thank you for your website and your tips! It’s always a great reprieve from everything else going on! Kathleen, it’s so good to hear from you again! Thanks for taking the time to write this. I am surprised that you can grow tomatoes! Isn’t your growing season too short for them up where you are? And for the rest of the stuff that you still have in the garden, do you cover them this time of the year? It’s funny that you mentioned planting in straw! I am currently filling a few garden beds with old hay from my goat fence. I want to see if I can plant directly in it in the spring without needing to purchase garden soil for new beds. We’ll see how this is going to work. I’ll try your method with the beets. Unfortunately, they didn’t do good at all in my fall garden so I’ll have to wait for next year. Again, thanks for stopping by! It’s great hearing from you.